Home News Why Use Radials? Many hams ask why they should bother to add the recommended radial field to their ground-mounted vertical antenna. There are reasons why it’s a good idea. Ground-mounted verticals use the Earth as their counterpoise. The vertical radiator is only half of your resonant or non-resonant vertical antenna. The other half is counterpoise; an imaginary radiator directly opposite, and on axis with, the wire or aluminum standing on the ground. This second half essentially makes your antenna a vertical dipole. Because of varying soil conductivity and chemical composition, some “ground” is better at the conduction of RF energy than others. Why does the ground need to conduct at all? The vertical does that. Consider that your antenna represents a load at the end of your coax. Ideally, the RF current flows out the center conductor from the transmitter, but also must flow back to thetransceiver on the coaxial shield to complete the current loop. If the vertical is radiating the current, then where does the returning current flow come from? The answer is the ground! A radial field enhances the ability of the ground around the vertical to conduct RF energy. 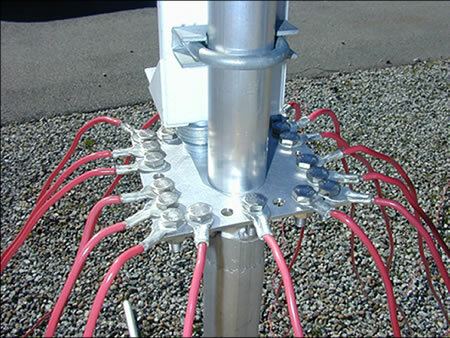 The radials “collect” the return current required for efficient antenna operation. Some hams complain that radials narrow the bandwidth of the antenna. This occurs because the radial system raises the “Q” of the antenna system. The higher the “Q” value, the more efficient the antenna will be. With a good radial field, radiation resistance will decrease, RF current will increase and bandwidth will narrow. That is just as it should be. Be aware that a poorly efficient antenna can have a good SWR. How efficient a radiator is a 50 ohm resistor across your coax? That’s called a dummy load and they all have very low SWR! When your vertical is ground-mounted, use a good radial field to raise radiation efficiency. You’ll have a better antenna system that will benefit your station and the joy of your radio hobby.